Living... in secrecy. Although they rely on him, the police know little about L – his nationality, his last name, or even what he looks like. Communicating via a computer-synthesized voice and an assistant, L keeps his identity in the dark. But with the amount of influence he holds, L's existence certainly seems to be a wealthy one. Visiting... Tokyo, the site of his latest case. 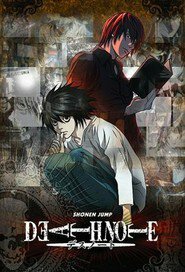 After criminals begin mysteriously dying by themselves, L quickly deduces that the killer is located in Japan. Now all that remains is to catch the elusive Kira ­– no mean feat, even for someone as intelligent as L.
Profession... world-famous super sleuth. When the police have a case they can't crack, they often turn to L, who then decides whether or not to take it on. However, because L considers solving cases his pastime, this decision is often made on the basis of how interesting a case is, not how important. "It's not a sense of justice at all," L easily admits, "simply prolonging something I enjoy doing." Interests... coffee, cake, and solving cases. Although in his mid-twenties, L often acts much younger – slouching, interrupting others, and consuming more caffeine and sugar than a college student. Yet if there's one thing L takes completely seriously, it’s solving his cases. Relationship Status... single. Not that he cares, anyway. Challenge... catching Kira, the killer or killers responsible for the recent spate of mysterious criminal deaths. While L possesses impressive resources and intellect, he may have found his equal in this supernatural killer who seems just as intelligent as he is. Personality... intelligent, blunt, and amoral. From his slovenly clothes to his tactless truths, self-consciousness plays no part in L's actions. Neither, really, does morality. In his words, "If it means being able to clear a case, I don’t play fair. I’m a dishonest, cheating human being who hates losing.” Still, despite his occasionally callous nature, L is decidedly on the side of the police – and his lack of scruples may actually prove a powerful asset in catching a criminal just as ruthless as he is. L's popularity ranking on CharacTour is #92 out of 5,000+ characters. See our top-ranked characters and read their profiles.